Rafi was so popular during the 1950s and 1960s, that literally, no Hindi film worth its name was complete without his songs in it. There were singers who suited and suited very well on a particular style of compositions/heroes but Rafi was a fit-all singer. He was ‘The Singer’ for all successful and great music directors, heroes and producers/directors of that era. Maestros and legends like Naushad, Shankar-Jaikishan, Roshan, Laxmikant Pyarelal SD Burman, Madan Mohan, C Ramchandra, Hemant Kumar, OP Nayyar, Ravi, Khayyam, Chitragupta used his voice to the best and gave Indian music lovers a treasure to last for years to come. Even RD Burman, who patronized Kishore, also started his career with Rafi’s vocals in films like Chhote Nawab and Teesri Manzil etc. and turned to him again in his later films. Rafi was not a strict ‘No’ for anyone but rather a first choice most of the times for all kinds of songs. So what was so unique about Rafi ? I believe there were quite a few reasons, one – Rafi’s voice – so smooth, so clear and so soft that you can keep on hearing it for hours and days together. It was a very balanced voice, neither too husky, nor too trembling and it fitted everyone. Two – he had a great range. Three- a unique singing style with a great throw of words and which never sounds too mechanical. Four – the ease with which he sang songs of all genres. Five – The feel which he brought into a song. Six – His soul stirring style and range which just takes you to the another world and which connects you to God.Listening to his songs is not less than a meditation for most. The list of his superhits is endless but I will just try to give you an example of his singing range : Suhani Raat Dhal Chuki (Dulari), Man Tarpat Hari Darshan Ko Aaj (Baiju Bawra), Ye Mahlon Ye Takhton Ye Taajon Ki Duniya( Pyaasa), Khoya Khoya Chand (Kala Bazaar), Hum Bekhudi Mein Tum Ko (Kala Paani), Yeh Mera Prem Patra Padh Ke (Sangam), Ramayaa Vasta Vayya (Shree 420), Parda Hai Parda (Aar Akbar Anthony), Hum Kissi Se Kam Nahin (Title song), Rang Aur Noor Ki Baraat (Ghazal), Din Dhal Jaaye(Guide), Badan Pe Sitaare (Prince), Baar Baar Dekho (China Town), Tum Jo Mil Gaye Ho (Hanste Zakhm), Nain Lad Jai Hain (Ganga Jumna),Door Rah Kar Na Karo Baat (Amaanat), Dard-E-Dil (Karz), Madhuban Mein Radhika (Kohinoor) etc. etc.. were all sung by this great singer. Rafi’s supremacy was challenged by Kishore and RD Burman (and Gulzar) combination in the late 60s (post Aradhana, 1969) and until mid 1970s but let us remember that, that was a very short period in comparison to his singing career of over 36 years. The period was a period of craze and fashion of a particular style and was not a permanent change. And even during that short period, Rafi was still a favorite of most of the music directors including the great duo of that time Laxmikant Pyarelal, for whom Rafi was always the first choice. If Kishore was a hit for Rajesh Khanna, Dev Anand and Amitabh (to an extent), Rafi was still favored by others including Dharmendra, Jeetendra, Shashi Kapoor, Sunil Dutt, Sanjeev Kumar, Rishi Kapoor, Dilip Kumar and Rajendra Kumar and many others. Arguably, no one in the film music world, worldwide has remained at the top for such a long and continuous period and it is one of the rarest feat by any standards in any industry. Mohammad Rafi died on 31st July, 1980 and I remember 1st August 1980, when I was just 9 years old.I noticed my sister crying after listening to the news of Rafi’s death on the radio. Music, for me, and for millions like me was synonymous with Mohammad Rafi and it had died. Rafi’s sudden death had created a big vacuum and many aspiring singers and clones tried to take his place after his death.But, his range and his voice to his side, no one and I stress, no one, even until now, could ever come close. Singers like him are not born twice. Period. I remember the days that when I used to get a monthly pocket money of Rs.200 during 1989-92, the first thing I used to do was to buy Rafi cassettes. I bought the cassettes even if there was only a single song which was not yet part of my collection. Unfortunately, in those days, when mp3s were not norm and Internet was just a new term launched, getting a rare song was a task in itself and believe me or not, I had not left any shop ‘unvisited’ in my home town Jaipur where I did not go and look for Rafi’s rare songs. Magar Rafi, Tere geet zuban se kabhi juda na honge. This entry was posted on Wednesday, October 17th, 2012 at 5:37 pm	and is filed under Meri Awaaz Suno. You can follow any responses to this entry through the RSS 2.0 feed. You can leave a response, or trackback from your own site. i love i respect mohammed rafi saheb like all other millions do. sangeet ku aap mohammed rafi par naaz hai. Greatest voice of all times. Mohammed Rafi sahab was a versatile singer,Rafi sahab deserve Bharat Ratna award,when lata got this award why not Rafi sahab? jo jhuthe dharmik he dharm ka dikhawa karte he unhe sabak lena chahiye .be’coz ishwar ki aradhana suron se bhi ki ja sakati .we must try to touch GOD by our heart,with heart’s deapth. bhagawan apane pyaron ko es gandi jhuthhi duniya me jyada din ke liye nahi chhodata.ek kalakar sirf ek insan hota he. not a human voice , this is “VOICE OF GOD” not be other RAFI sahab. it is our good luck, we can listen singing an angel. no words on the earth to praise RAFI sahab. an ocean of Saptswars. I totally agree that there is no point for anyone trying to compare the likes of the heavenly voice of mohd rafisahab with kishore kumar because there simply is no comparison. Mohd rafi was singing for decades before kishore hit the high time. It’s also nice to read comments such as comment no 35 where people can admire and appreciate mohd rafisahabs songs even if they’re not familiar with the language as his voice was truly mesmerising and melodious which cannot be said for kishore kumar’s voice. AS for Yash chopra I think it was his loss in the long run because I didn’t really like any of his film because interesting and beautiful locations in my opinion do not make a good film!!!!!!!!!!!!!!!!!!!!!!! It is disturbing to notice that rafi is time and again compared with kk..let us stop doing that..rafi was light years ahead of kk and it is belittling rafi if we keep comapring him with kk and with some or other justifications..
Let us talk about rafi and not rafi vs kk..no point. Tum Bin Jaau Kaha was first recorded by Kishore da, later on when RDB asked Rafi to hum “Tum Bina jaau kaha “after Nisultana Recording then RDB was so impressed that he recorded this song for Shashi twice in this movie,Kishore da had already recorded 2 version of this song.Thus this song has 4 versions 2 by Kishore da and the same number by Rafi saab.My personal favorite is “Meri nazar me tum hi tum ho” brilliantly rendered by our beloved Rafi saab. post 27 rajesh ji –your father was one of the best screen play writers the industry ever had.. being a small writer myself i adore his work..you rightly described the unfortunate co- incidence of three consecutive deaths in 1980..
who had sung lines with Rafi Sahab for Song Parda Hai Parda.. the Lines for Amitabh. Is it Rafi Sahab himself after changing the Scale ?? Rafi sahab was a true legend and even after so many years of his death his fans have increased and not decreased. plus he was a wonderful soft hearted human being too. 1980 is considered a black year in the annals of taye Hindi film industry. It is high time that Mohammad Rafi Sab should be awarded Bharat Ratna. Yes salim ji, this was a difficult and great song but was not as big a hit as was tu hindu banega na mussalman banega. Well done Manish. How can one forget the unmatched rendition “damaan mein aag lagabaithe bete” from Dhool ka phool. Rafi’s voice possessed an energy, very unique which no other singer possessed. When we hear him this energy transcends to us and make us energetic. composer ravi has told b r chopra that the title song from waqt could ‘only’ be sung by mohd rafi. waqt was directed by yash chopra. b r chopra – agreed to the composer’s point even though rafi saaheb was not singing for any b r films. another song which rafi saaheb sung for b r film is from dastaan : Na tu zameen ke liye na tu aasmaan ke liye. but, this was a background song sung for dilip kumar for whom the legend had stopped singing . YASH CHOPRA DIED- A SAD NEWS FOR ALL OF US – A FILMMAKER WHO NEVER USED MOHD RAFI EXCEPT ” TU HINDU BANEGA YA MUSALMAN BANEGA..”- PROBABLY THE ONLY SONG THAT RAFI SANG FOR YASH CHOPRA.. HIS FILMS ARE REMEMBERED FOR ROMANCE, LOCALES, ACTING , DIALOGUE – BUT NOT MUSIC..!! Rafi Sahab possessed a Heavenly voice which was a gift from our Lord to us, the inhabitants of this world. But this indeed is a world of greed, betrayal, torture, exploitation, injustice and so on. So, the Lord took him up there where there are no such things. May be the Heaven Dwellers are enjoying his golden voice as we speak here and missing him. He was just a saint for me and, I believe, for many others. kash mere pas time machine hoti to mai playback singing k god se jarur mil kar aata. .
You really hit the nail when you mentioned that one can listen to Rafi Saheb’s songs for hours. I think he is the only male singer whom, atleast, I can listen for hours and not get bored. Is there any censures in this forum? My earlier post is missing. Can some one tell me who contact to clear this and publish an article. i would talk about many other geniuses who favored rafi all the time and created timeless gems instead of a duo who used rafi (and most other singers) on an on and off basis despite of rafi giving them many of their best numbers through out their career. for me, naushad, mandan mohan,sj, roshan, ravi, lp,chitragupta,opn and most others who never left him and for whom rafi was supreme and for whom rafi created gems like no one else could ever have matter much more than this duo. i am not a great record keeper but what my friend told me stunned me. his opinion was that sdb recorded most of his songs with rafi saaheb prior to 1969 and then abruptly stopped taking rafi saaheb. prior to this all the romantic and difficult hit ghazals – went to mohd rafi and the lighter easier ones went to the lap of kishore kumar like the gaata rahe mera dil number which any singer could sing including the newcomers singing in the tv make believe competitions. two facts must be mentioned herein. first that sdb’s market equations was always on par being ever green all time. second, the father and son team always had hits with mohd rafi and those songs are cherished even today. 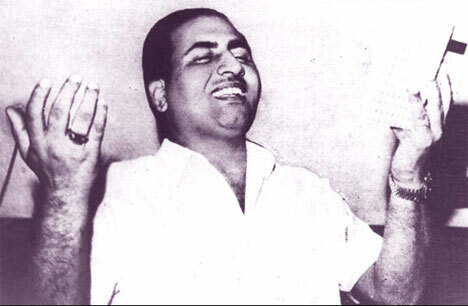 who could have sung ‘kahin bekhayal hokar… and mera man tera pyaasa….the way the legend has sung. Thanks binu ji and bishtji for your appreciation.thru this forum, may i request if anyone has copies of newspapers of 1st Aug 1980 and if he can share it with the rafians. Mohd Rafi was, is and will remain the best male playback singer ever…no one can sing like the way he did..he was amazing! just amazing…an angel of the Lord. Post 7 gautam jee.. pl read binu nair’s post 4 between the lines.. no doubt sdb was senior in age and therefore obviously he started his career before rafi sahib. however, the fact remains that sdb is remembered for his rafi songs and not for his 1930 songs..an irony may be recalled here is that when filmfare gave life time achievement award to shashi kapoor – the song being played was none other than ” tum bin jaaoon kahaan ..” but in kishore kumar’s voice ( ! )whereas in the film rafi saab had beautifully rendered this song for young shashi..any comment/reply for this ..? gautam, it is true that sdb used rafi less before 1957 but it is equally true that sdb became sdb only post 1957..his pre 1957 tunes were hits but not as big as post 57.rafi gave mds the freedom of creativity as his singing had no limits whatsoever.so with rafi, the mds grew too.arguably,few mds who could not exploit rafi’s talent finished sooner relatively.keep writing. I fully concur with the views of Jawad Rana. Rafi & Latha are trend setters with no basis for comparison with others!! Rafi Jee and Lata Jee are the dictionary of playback singing full stop. comparing them to any singer, or talking about there up and downs is an insult to them, they are, they will, and will always remain the optimum of playback singing. New, upcoming, and Old Singers can only be compared but never equaled. Mr. Binu Nayar In reply to you post I would like to say please don’t mix up r.d. burman with S.D.Burman. They may be father and son but they have an ocean of difference in the quality of music. Please be informed that S.D.Burman was pioneer of modern music from Bengal. Not only that He was the Best singer from 30s along with K.L.Saigal and Pankaj Mullick. Now for your information I would like to mention that S.D.Burman’s career did take off without Rafi saheb(my most favorit singer from post Saigal era). S.D.Burman had huge number of hit songs with Talat Mehmood, Hemant Kumar and Kishore Kumar before he finally switched to Md. Rafi in 1957, i guess. Even that had a history. You will notice that Lata stopped singing S.D’s tune since 1956-62. Asha and Geeta was singing all female voice in S.D’s tune. I guess S.D. was not feeling very confident about his film songs being hit like before. So he switched to Rafi for the male voice of his tune from PYAASA in 1957, i guess. pls look in to this and suggesting a method so that regular contributors comments are ‘not held’ up due to red-tapism, i would term it. can u think of s d burman and r d burmans career taking off ‘without rafi saaheb’ (Post 3 ). can you think of lata’s and asha’s duets becoming a hit ‘without’ the dulcet voice of mohammad rafi saaheb? r d burman first records “tum bin jaaoo kahan” in the legends voice and then give it to the other singer to improvise the song. how many of us know that there are more than three versions of ‘tum bin jaaoo kahan”? mohd rafi saaheb is evergreen and immortal and come this december – all the auditoriums are booked for mohd rafi shows on his 88th birth aniversary at mumbai and elsewhere. Rafi Saab can’t be compared with any bollywood playback singer. he had unique style of singing. i prefer to listen only those songs which hv his voice otherwise i dont consider hearing the song. yes, if his song is being broadcast then no other other programm can divert my attention till his song is over. Can’t get another Rafi Saab on this earth. besides his excellent voice, he was a very kind hearted and soft spoken person and socially a saint. great write-up right from the heart manish ji. your story of buying a cassette from the pocket money will be echoed by many rafi saaheb lovers. on aug 1st when we opened the news papers it was the most dreaded day of our lives as it had the picture of rafi saaheb with the news : Mohd Rafi dead. one fact man y wont know is about rafi saaheb is that he had stopped singing for a while during the seventies and that was the reason why his songs were heard less. how prophetic it was as from 1978 onwards, it was a different mohd rafi that our ears heard. there were hits after hits. i myself heard him belting out one hit after another at the famous shanmukhananda hall. mai jath yamla pagla diwana was the gem that floored the audiences along with his swan song – oh duniya ke rakhwale. almost eleven songs in the binaca geet mala out of sixteen – few months before rafi saaheb left us. rafi saaheb had stormed the bollywood music industry to use a lighter phrase – like no one.